On April 10th, 2010 Picture Palace music gave a concert at Castle Satzvey as part of a EM festival. On this occasion, the band released the album Fairy-Marsh-Districts. While the first four tracks were especially composed for this event, track five and six were two more outtakes from the (yet unreleased) soundtrack for the Faust movie. The remaining two tracks are remixes from compositions released on the album Somnambulistic Tunes (2007). The PPM website about the EP "Picture Palace music in Mediaeval-Mode between Electronic Minnesongs, Post-Rocking Diaphonie & Psychedelic Ars Nova! Fairy-Marsh-Districts is about Castle Satzvey myths and sagas. Imagine the gloomy mediaeval spirit of the Dark Ages and the lethal incident of a young maiden drowning in a foggy and morbid looking territory. 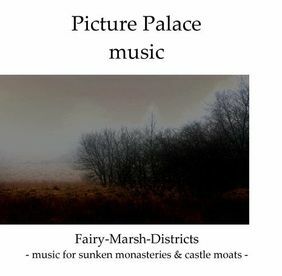 Picture Palace music provides the listener with the soundtrack of that acherontic scenery. This EP contains over 46 minutes of music including brand new tunes as well as alternative versions of two tracks from the Somnambulistic Tunes album."